SignalR is a Technology that enable Real-Time messages/contents to be pushed from server to connected web clients without the need to refresh the web pages every specific period of time. In the old days, we used to have schedule timer on client side to request new data from server every specific period of time to update client UI with the new data. with SignalR this is no more the case. 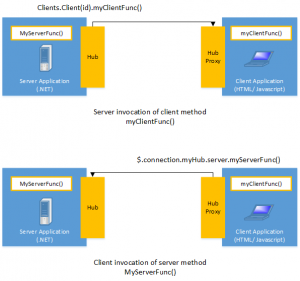 Microsoft published a specific library for developers to enable them to add real-time functionlaities to asp.net web application . It is worth to mention here that SignalR is an open source project an you can check the source code on GitHub. Also SignalR supporting Scale out to thousands of clients using Service Bus, SQL Server or Redis. This enable SignalR to work seamlessly in Web Farm or Web Garden environments with no issues to mention. 1. Persistent Connections: A Connection represents a simple endpoint for sending single-recipient, or broadcast messages. The Persistent Connection enables the developer to have a direct access to the low-level communication protocol that SignalR exposes. 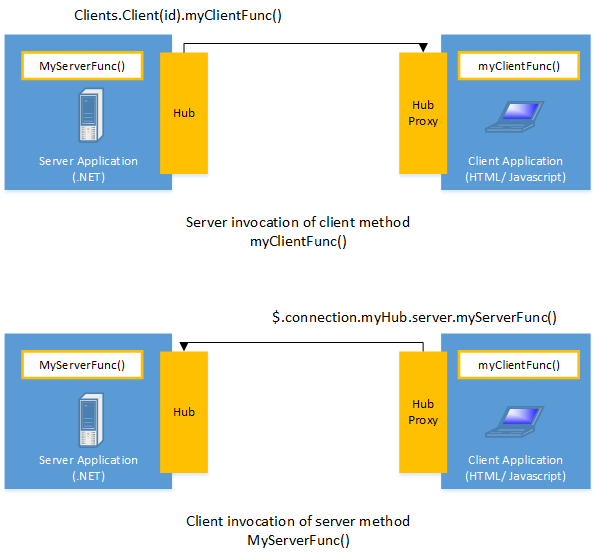 for those who worked with connection-based APIs in Windows Communication Foundation WCF, will be easily getting familiar with this model. 2. Hubs: is a more high-level that is built on top of connection API and allow server and clients to be able to call methods on each other directly and seamlessly. It is SignalR responsibility to handles the dispatching messages over the internet; SignalR MAGIC! For those who use Remote Invocation APIs such as .NET Remoting will be getting familair with this model easily. The Hub Communication model is suitable for most of the applications needs. For me I never get into a case where I have to use Persistent connection model, and I always go to Hubs model.